The DOE wants to shore up coal and nuclear power plants in the name of resilience. But what does the term even mean? Regulators desire a more resilient grid to hedge against increasingly intense weather events, among other issues. "Resilience" may be the hottest trending topic in the electricity sector today. The Department of Energy’s recent report on the impact of coal and nuclear power plant retirements, and subsequent notice of proposed rulemaking (NOPR) that seeks to subsidize those units, brought the concept of resilience to the fore. Does it improve resilience to have 90-days of fuel on site -- something only coal and nuclear can really do -- as the DOE suggests? And more fundamentally, what is resilience and how can it be measured? Despite the DOE’s claims, stakeholder comments confirm the electricity system lacks an agreed-upon definition or metrics for resilience as a concept -- separate from reliability. Furthermore, it’s unclear that either requires FERC action; the North American Electric Reliability Corporation (NERC) already ably regulates reliability and resilience on the bulk system. It is true, though, that bulk and distribution system regulators desire a more resilient grid to hedge against increasingly intense weather events, greater economic reliance on continuous electricity service, a more variable and distributed generation fleet, and greater threats of cyberattacks and physical assaults. Resilience is increasingly a focus for state-level utility stakeholders, particularly in the context of grid modernization. At NARUC’s 2017 Annual Meeting, three hours of subcommittee meetings discussed grid resilience, and a general session, ominously titled “Mother Nature, the Ultimate Disruptor,” addressed resilience improvement efforts across critical infrastructure. In this context, taking stock of what we know about resilience -- and what we don’t -- is useful before approving large-scale investments or payments in resilience's name. Reliability and resilience are intertwined and often conflated. NERC, which has FERC-delegated authority under the Energy Policy Act of 2005 to create and enforce reliability standards for electric utilities and grid operators, defines reliability as a combination of sufficient resources to meet demand (adequacy) and the ability to withstand disturbances (security). To hold reliability authorities accountable, NERC monitors the ability of reliability coordinators to respond to generation or transmission outages. For example, NERC penalizes excessive system frequency and voltage deviations, two leading indicators that system operators may have inadequate resources to respond quickly to unforeseen supply and demand imbalances. A commonly used and accepted adequacy measure is the percentage of capacity in excess of projected or historical peak demand for that system -- although precise adequacy standards differ between reliability regions, subject to NERC approval. Adequacy also includes essential reliability services like frequency and voltage support, and will increasingly require a focus on flexibility as more wind and solar come on-line. Security is harder to measure, as it reflects preparedness to endure uncertain external forces. Modeling and thought exercises help, but the impacts of low-probability, high-impact events remain difficult to predict. NERC is on the case, promulgating cybersecurity, emergency preparedness and operations, and physical security standards to ensure grid operators and utilities are prepared for attacks or blackouts. The impacts of inadequate resources or security against anything from hurricanes to squirrels to cyberattacks can be measured in terms of outages. 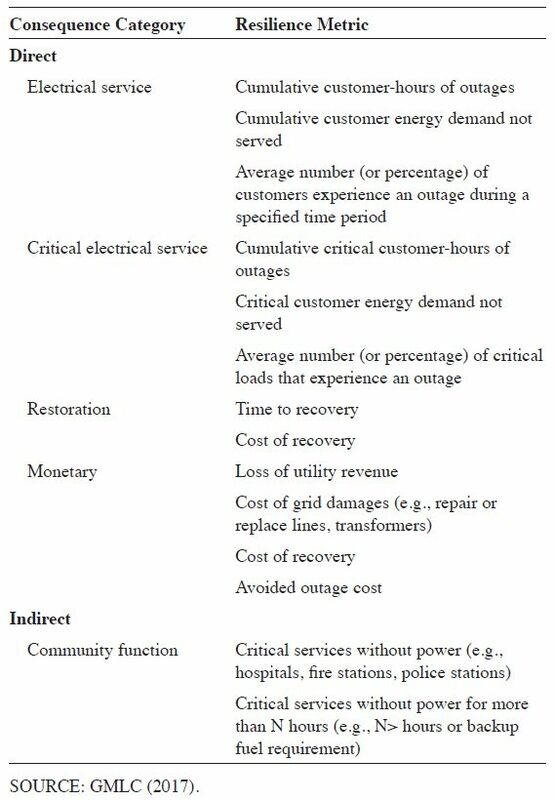 Reliability is generally measured in terms of the system average duration and frequency of outages (SAIDI and SAIFI), with different permutations based on whether the system average or customer average is more important to the reliability regulator. Resilience is a more expansive concept than reliability, encompassing consequences to the electricity system and other critical infrastructure from increasingly likely high-impact external events. Reliability metrics like SAIDI and SAIFI generally make exceptions for extreme weather events when measuring utility performance, whereas resilience is often articulated as a grid attribute that improves the response to such events. DOE’s own Grid Modernization Laboratory Consortium is already exploring reliability metrics for “critical customers” as resilience indicators. A resilient grid may go down for some time, but preserving or prioritizing restoration for critical customers like hospitals, water and sanitation systems, first responders, communications towers, and food storage is important. 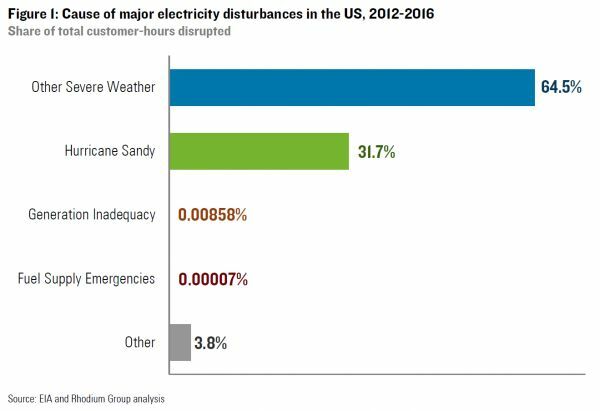 Resilience is also additive to reliability around system recovery, recognizing that low-probability, high-impact events will inevitably cause outages -- the key is investing in infrastructure that reduces outage duration, cost and impact on critical services. New technologies that increase system awareness and automation, particularly on the transmission and distribution system, allow for rapid islanding of downed circuits before failures cascade across the distribution system, rerouting power while isolating reliability issues and hardening the grid against new threats. Despite new research into resilience, reliability regulators (particularly NERC) already perform most of the work needed to ensure that the grid, and particularly the bulk power system, is resilient. Resilience’s additive elements are few but important, and fall to specific applications like severe weather events, continued service for critical infrastructure, and improved recovery through grid awareness. Attempts to improve resilience through a rulemaking that focuses on fuel security or resource adequacy miss the point -- these service elements have been improving steadily for years and can be procured in a technology-neutral way, with a capable NERC at the helm. Economic forces and policy priorities are driving a transition to a cleaner, more variable power mix. At the same time, customers are becoming more participatory. Each of these transitions affects resilience in different ways. Damage to the distribution system caused the vast majority of outages over the past five years. Conceptually, the availability of fuel to power plants could also be a cause, but data shows it is a very unlikely cause of outages -- only 0.0007 percent of outages were caused by fuel security issues. Still, the transition from fuel-based power to higher shares of renewable energy affects bulk power system reliability and resilience in a blend of both positive and negative ways. For human-caused events, such as cyber or physical attacks, renewables can help to reduce fuel supply risk. Coal relies on rail delivery, which is subject to physical attacks, since roughly 40 percent of U.S. coal comes from Wyoming’s Powder River Basin, and nearly all via the 103-mile Joint Line rail corridor. Nuclear plant destruction could be potentially catastrophic. And natural-gas pipelines are vulnerable to cyber and physical attacks, though some delivery will continue if one line is disrupted. Converting to renewables avoids these fuel security issues; however, cost-effective integration of a high share of utility-scale renewables depends on increasing transmission system capacity. Taking down one or two lines could disrupt the system’s ability to balance, either on a regional or interconnection-wide basis, hampering reliability until the threats are addressed. Natural events, particularly weather-related events, must also be considered. Hydroelectric generation is drought-vulnerable, while cloud cover from intense storms and hurricanes can threaten solar availability. Extreme winds may force partial wind curtailment for short periods of time. As during the 2014 polar vortex, coal piles on-hand can freeze, and co-dependence on natural gas for heating and generation during extreme cold can threaten resource availability. Prolonged heat waves can leave nuclear unusable if cooling water is too hot. Combining inverter-based storage and generation may be more effective at performing a black start during outage recovery than big centralized power plants, since spinning masses would not need to be synchronized, although we lack practical examples of restarting with very low spinning mass. As Amory Lovins recently wrote, nuclear plant performance restarting after the 2003 Northeast Blackout was abysmal, taking weeks to come back on-line at full capacity. Distribution systems increasingly rely on distributed, small-scale devices to provide resilience services that complement centralized generation and contribute to a smarter, more connected, and more automated distribution system. 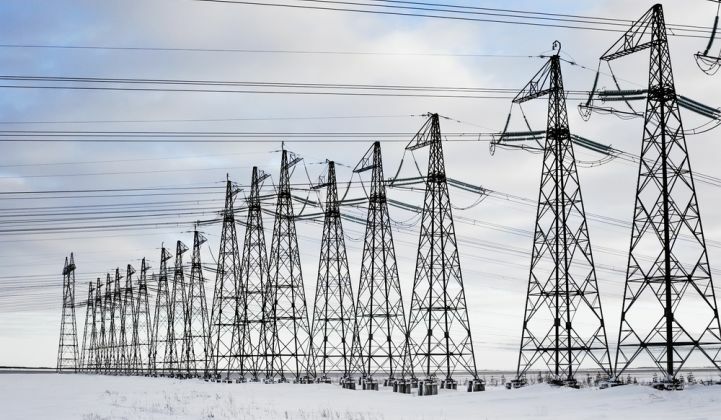 Connected devices can identify and isolate grid threats while preventing cascading failures and improving restoration, but may increase the risk of more widespread cyberattacks. Local generation can also offer resilience during natural events. The Borrego Springs microgrid pilot in SDG&E’s territory, for instance, allows a remote community to disconnect from the larger grid and maintain critical services during wildfire and high wind seasons, which threaten a critical transmission line from generation closer to load centers on the coast. Resilience centers on withstanding and recovering from high-impact events. Policymakers can largely trust the existing reliability apparatus to cover bulk power grid resilience. NERC already provides standards for cybersecurity, and NERC’s Essential Reliability Services Working Group is quantifying the services needed to maintain and improve both reliability and resilience. Still, NERC covers only the bulk electricity system. Restoring the distribution grid requires other infrastructure, like gasoline delivery and roads for delivery trucks, while critical service providers rely on electricity service too. Utilities and their regulators take disaster preparedness seriously; however, creating a cross-agency planning process could improve and align agencies responding to threats. Instead of duplicating NERC’s efforts, state policymakers can focus on grid modernization to deliver a resilient and flexible last mile of customer delivery. Knowing what they’re paying for is crucial to adopting cost-effective resilience assessments that balance affordability and disaster preparedness. To ensure cost-effective resilience, policymakers should develop resilience metrics for the distribution system tied to measurable outcomes, starting from Resilience Analysis Process work already performed by Sandia National Labs. SNL’s seven-step process develops and updates resilience metrics in light of new modeling and actual system disruptions. America’s Power Plan also published a five-step framework, “Getting the most out of grid modernization,” to help policymakers turn metrics into action and hold utilities accountable for delivering resilience and other customer value. These developments are taking place in the context of a dramatic energy transition with growing adoption of connected distributed devices and variable fuel-free generators. When assessing the cost and reliability of a future electric grid with high levels of renewable energy penetration, resilience attributes and metrics can figure into the mix, but only if they go beyond existing reliability frameworks. 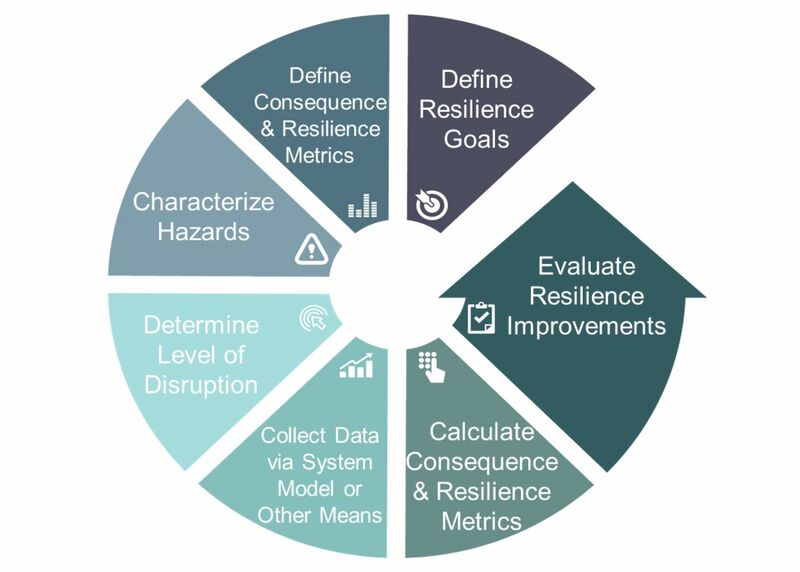 The benefits of improved resilience should be incorporated into grid planning, and where gaps are found, utilities and other stakeholders should prioritize technology-neutral attributes, such as flexibility, to meet resilience needs.